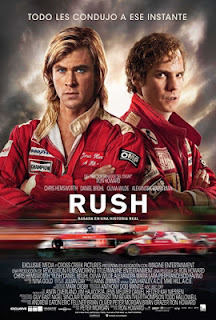 Reparto: Chris Hemsworth (James Hunt), Daniel Brühl (Niki Lauda), Olivia Wilde (Suzy Miller), Natalie Dormer (Gemma), Lee Asquith-Coe, Alexandra Maria Lara, Julian Seager, Tom Wlaschiha, Joséphine de La Baume, Jamie Sives, Pierfrancesco Favino, Alessandro De Marco, Christian McKay, Rebecca Ferdinando, Chris Cowlin, Lee Nicholas Harris. Producción: Andrew Eaton, Eric Fellner, Brian Grazer y Ron Howard. Productoras: Action Concept Film- und Stuntproduktion, Cross Creek Pictures, Egoli Tossell Film, Exclusive Media Group, Imagine Entertainment, Merced Media Partners, Revolution Films y Working Title Films.